Many visitors come here to see the Alhambra, that magnificent Moorish palace with its exquisite tile work and magical water gardens, but discover many more unexpected pleasures. And most of our picks of the best places to stay in Granada are well situated to access not just the Alhambra, but all the other delights that the city has to offer. We have a wide selection of properties: from a historic luxury city centre hotel, to charming guesthouses that won't break the bank. For those looking for a city apartment or holiday villa just outside the centre, we recommend our online partner, Booking.com. This is one of Andalusia's freshest, most welcoming cities, with a lively bar scene - each time you order a drink in a bar you get a small tapas dish gratis - and sultry flamenco clubs. The calm trickle of water greets visitors to the Alhambra, and accompanies you everywhere, despite it being an arid spot. The water features are like art, as are the mosaics, the intricate woodwork and the complex calligraphy rendered in the plaster and tile. Granada's Islamic past has marked the city, and the influence remains - 10% of the population is still North African. One of the best ways to experience the living culture is to visit a hammam. Try the Hammams de la Andalus, where there are three pools of different temperatures and then the option of having the whole skin scrubbing massage as well. Food is a big thing in Granada. One of the best places to stay in Granada for foodies is near the Plaza Pescaderia, where the staple is fresh fish and jugs of sangria. Or you could try the Paeso de los Tristes where there's a string of excellent tapas bars. Plaza Nueva - located bang in the centre of town, this is an ideal spot in which to stay if you want to spend your days soaking up all the sights that Granda has to offer. Be sure to check out the bustling Mercado San Augustín, arguably the city's finest food market. Sacromonte - this hillside neighbourhood was historically home to the city's gypsies. Nowadays, it's better known as the city's flamenco barrio - and is rather unusual in that certain locals still live in caved dwellings carved out of the hillside! Realejo - the Jewish neighbourhood is home to a wide variety of dilapidated yet utterly charming buildings, made even more striking by the works of local graffiti artist 'El Niño'. La Cruz - whilst not as aesthetically pleasing as other areas, with plenty of large apartment blocks, La Cruz boasts a large number of delicious tapas bars and a friendly local atmosphere. For many people the best places to stay in Granada are those closest to the Alhambra, but don't forget that these will be the most popular properties in town, so early booking is absolutely essential. The Hotel Santa Isabel La Real is ideal if you're looking for something close to the centre of town. In fact it's possible to book tower rooms with views of the Alhambra. A small and family run guesthouse, this is our recommendation if you value a personal touch. They make you feel as if there's nothing that's too much trouble. 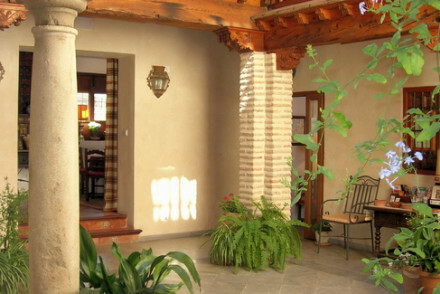 El Ladron de Agua is a chic manor house conversion in the centre of town. It offers a sophisticated stay with stylish rooms adorned with antique furnishings. 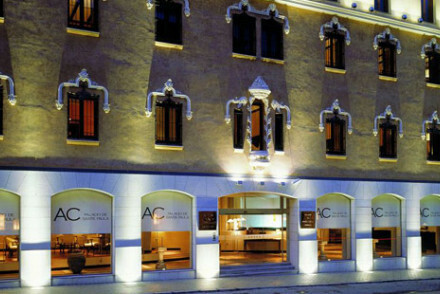 AC Palacio de Santa Paula boasts a stunning mix of Moorish facades and contemporary interiors. 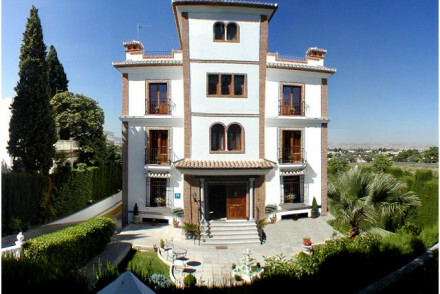 And it's situated within easy reach of all of Granada's best bits. The restored 17th century property Casa 1800, Granada, perfectly encapsulates Andalusian elegance in the heart of Granada. Villa Oniria is a gorgeous Andalucian style manor house. Alongside beautiful accommodation there's a gourmet restaurant, and spa with indoor "Effects pool". 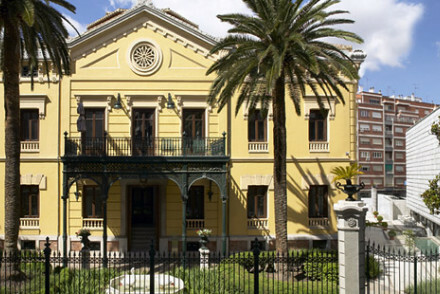 At Hospes Palacio de los Patos you get elegant luxury and a fabulous restaurant, right in the centre of town. Plus there's a top-notch spa with indoor pool, Turkish bath, dry sauna and much much more! 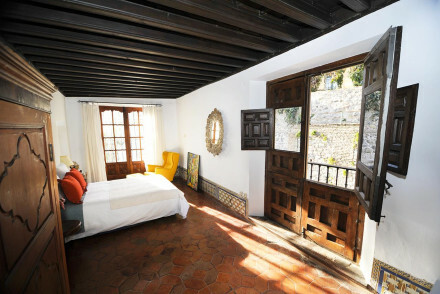 Carmen del Corbertizo is a chic seven bedroomed property in Granada's boho quarter. The Arab-style plunge pool in the charming courtyard garden is the icing on the cake. 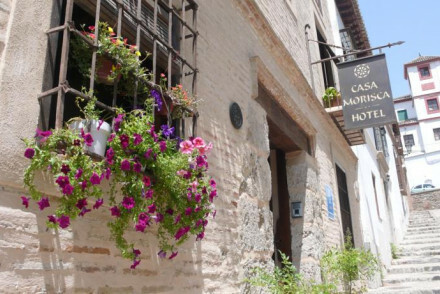 If you're looking for something a bit special book the beautifully restored 15th Century townhouse, La Casa Morisca. Built around a galleried internal courtyard with a serene marble pool at its centre, this guesthouse feels like a step back in time. Parador de Granada is a luxurious option, that's prefect for a romantic break. You'll find elegant rooms, fabulous Andalucian cuisine and a gorgeous roof terrace with a view. 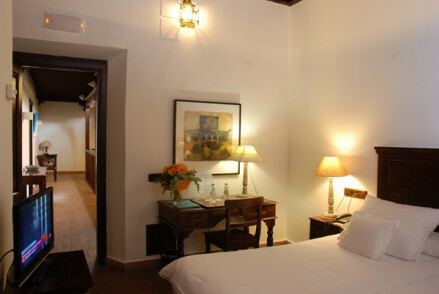 Hotel America offers a rustic chic feel within the Alhambra's citadel. The rooms are simple and charming and there's a lovely courtyard garden. Rooms start from just €90 per night. Hotel Villa Sur is a seriously cheap option, in a quiet spot just outside town. You can bag a double room here for as little as €58 per night! Casa del Capitel Nazari is the more expensive option (doubles from €125). It offers traditional Andalucian elegance, some rooms with a balcony, plus a courtyard for sitting out. Located just outside Granada the Cortijo del Marques boasts gorgeous countryside views and a fabulous pool. The traditional stone built, La Almunia del Valle, has an enviable location in the hills of Sierra Nevada National Park with both easy access to the surrounding park and the city. For a self-catering apartment or holiday villa, check out the wide range with our online partner, Booking.com. Fly to Granada Airport - located just 15km outside the city centre. Best time to visit Granada is either spring or autumn, when the days are warm but not scorching (15°C - 20°C), and the crowds should have thinned. Ideal for days spent sightseeing! Browse through our list of all the best places to stay in Granada. Expand your search to include all our recommendations in the region of Andalucía. 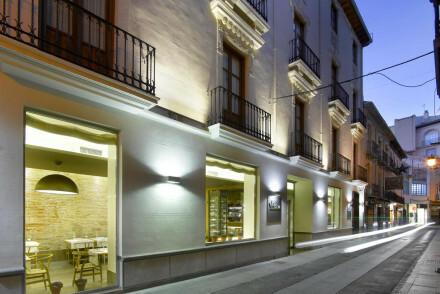 Sharp and sleek, Parrage Siete is a great option in the heart of Granada. Set in a beautiful 19th century building, the interior design is contemporary and stylish. With the centre of Granada on the doorstep, it's a great launchpad from which to explore the city's unbounding charm. Great walks - Walk up through Granada's hilltown to the San Miguel Alto for superb views out over the city and its surroundings. Sights nearby - Wander up the hill and visit the magnificent Alhambra. A quiet hotel in an Andalusian house. Traditional rooms feature stone floors, antique style furnishings and all the mod cons. An outdoor pool, neat gardens and terrace with jacuzzi. Close to Granada but still in a secluded spot. A lovely base from which to explore the abundant sights around. Local exploring - Historic sights of Granada as Charles V Palace. Also within a short drive Alpujarra, Sierra Nevada and the Costa Tropical. A 16th-century mansion, built around a courtyard, having undergone a complete revamp now offers chic contemporary accommodation. Rooms are simply styled with crisp white linen, minimalist furniture and luxurious bathrooms. The best have views of The Alhambra. Local exploring - Perfectly located just steps from Granada's most famed attractions. Sights nearby - Visit Granda's most famed sight, The Alhambra, just 10 minutes from the property. Great walks - Stroll along the canal to the majestic cathedral. An historic palace situated just outside Granada offering luxurious accommodation, a fabulous swimming pool and a little solitude. Choose from grand and traditional or chic and contemporary rooms all offered at very reasonable rates. Local exploring - A luxurious property set in a tranquil spot just a short drive from Granada and its many cultural attractions. Great walks - Take a stroll around Granada’s Arab quarter, part of the city's UNESCO site. Local markets - Search for Fajalauza ceramics and Moorish-style earthenware at Alcaiceria. Sights nearby - The magnificent Alhambra is an absolute must visit. Boasting a central location and a very attractive price tag the Palacio de los Navas features 19 chic rooms. Style throughout mixes the building's original features with a clean contemporary feel. Indulgent breakfasts are served and you're just steps from the city's major attractions. Value chic - A charming small hotel with a great central location all at very reasonable rates. Sights nearby - Visit Granada's main attraction, The Alhambra. A stunning country house hotel with sweeping countryside views. Atmospheric rooms, family suites with some four poster beds, with fireplaces, wooden beams and stone floors. Small swimming pool, gardens, good restaurant. Close to Granada, lots to do around too. Families - 2 family rooms sleep 4. 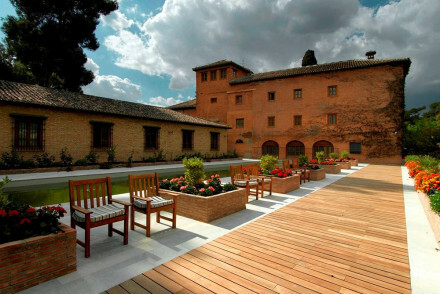 A rustic chic hotel within the citadel of the Alhambra palace. Charming rooms have antiques, wooden beams and warm coloured furnishings. Delightful courtyard garden with fountains, brilliant Granada-style cuisine. Famous sights on the doorstep, very quiet atmosphere. Romantic and family friendly. 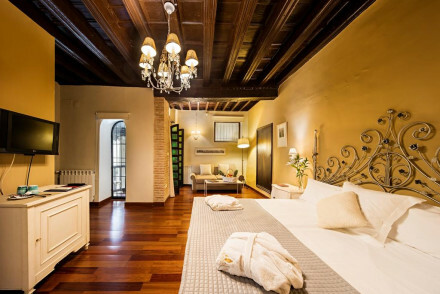 A converted 17th century palace offering boutique accommodation in the heart of historic Granada. The design is chic yet still traditional giving an authentic feel but with all the modern comforts. Start the day with home-cooked cakes and tortilla before heading out to explore the city. Local exploring - Perfectly positioned to access Granada's attractions by foot. Sights nearby - Visit the impressive Alhambra, one of the most important national monuments. 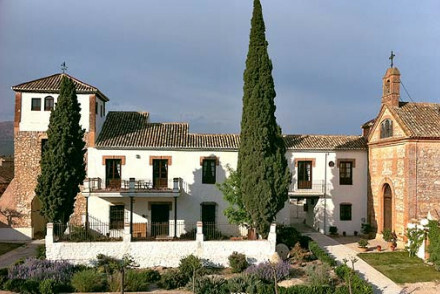 Beautifully restored 15th-century house in prime location a short walk from the Alhambra. Centred around a stunning galleried inner courtyard. Traditional white washed rooms with local artefacts. Brightly tiled spacious bathrooms. Ideal for local exploring. Total relaxation - This charming hotel pulls its guests back time and time again with its laid back atmosphere and stylish Morocan interiors. Local exploring - Situated in the heart of Granada with sunning views of Alhambra, wander the streets and discover hidden treasures. Great walks - Explore the narrow streets of the old town, taking in the Christian churches, Moorish architecture and Moroccan gift shops. Sights nearby - Visit the historic and unique Muslim medieval palace Alhambra and The Cathedral of Granada, both minutes away. 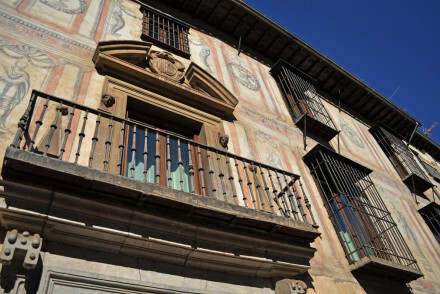 A 17th century building located in the heart of Granada. Traditionally dressed rooms are spacious and luxurious with dark beams, polished wooden floors and elegant floor to ceiling bedrooms. Breakfasts are served in the stone-walled cellar and you'll find yourself just steps from the main sights. Local exploring - Well positioned in the centre of Granada, ideal for exploring the city by foot. 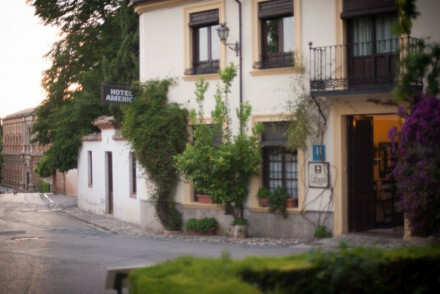 Great walks - Take a stroll through the beautiful streets of Carrera del Darro. Sights nearby - Just a 10 minute walk from the famed Alhambra. Fantastic guesthouse in the hills of Sierra Nevada National Park. A traditional stone building with charming rooms that blend contemporary elements with stone floors, fireplaces, wooden beams and creamy furnishings. Fantastic views from terraces, pool, excellent food, and lots of activities around. A picturesque palace hotel in traditional Andalusian elegance. Bedrooms have wooden beams, stone floors, and white washed walls. Roman columns, sweeping balconies and a lovely courtyard ooze romance. Great value too. Charming family-run guesthouse with views in a picturesque setting. Bright, pretty, simply furnished rooms overlook an inner courtyard. Stunning views over the white washed old town. A quaint breakfast room with an excellent buffet. Ideally positioned to explore the town. Romantic Break - Lovingly decorated rooms, some facing the spectacular Alhambra vista, plus an inner patio with tinkling fountain. 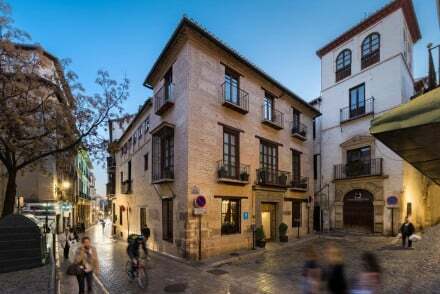 Local exploring - Ideally located at the heart of Granada's old town, perfect for exploring these romantic lanes and alleyways. Sights nearby - Visit the spectacular Muslim palace Alhambra, Spain's largest surviving piece of Moorish architecture. Great walks - Stroll around the narrow alleyways of Albaicín, one of Europe's most beautiful medieval quarters. A stunning mansion renovation that combines romantic original aspects with cutting edge modern design. Monochrome, yet still classic rooms and suites with lots of natural light and sumptuous furnishings. Fabulous restaurant and state of the art spa. Sophisticated and grand. A stunning mixture of Moorish facades and cutting edge modern design for stylish effect. Modern rooms and suites of various sizes and designs, all with state of the art modern gadgetry. Two fantastic restaurants, spa, and grand living areas. A Five Star spot. A gorgeous four star manor house hotel in Andalusian style. 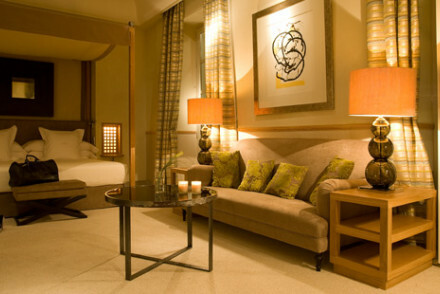 Contemporary chic rooms and suites with subtle lighting and creamy/light wood furnishings. Superb herb garden and central restaurant courtyard. Excellent spa too. A romantic city spot. 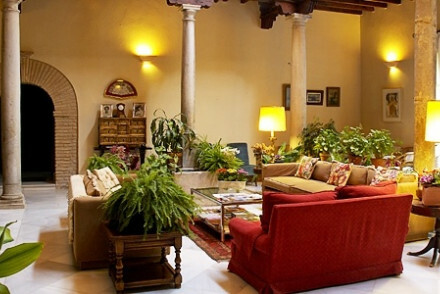 In the heart of the historic Albaicín, this beautiful guesthouse retains many Moorish features; high walls, a courtyard and decorative Moroccan tiles. Guests can relax in bright, spacious en suite rooms with beautiful mahogany furnishings, all with unique views of Granada’s narrow winding streets. A chic small hotel with magnificent terrace views of the Alhambra and charming rooms in Granada's boho quarter. Rooms, some sleep 4, have an eclectic mixture of antiques, chintzy wallpapers, Persian rugs, mosaics and private balconies. The garden, terraces and plunge pool are a treat. Full of charm. Sights nearby - The Alhambra - the biggest surviving piece of Moorish architecture. A chic manor house renovation in central Granada. Stylish rooms and suites in neutral tones with stone floors, antique furniture and private balconies. A sophisticated choice for families and couples alike. Encapsulating Andalusian elegance at the heart of Granada. 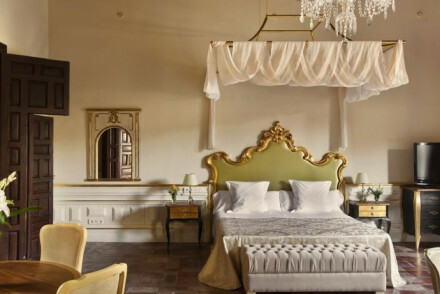 This restored 17th century property exudes historic charm with its ornate decoration and palatial rooms. Cream palettes create a sense of modern luxury. Perfectly located for exploring the city's rich Moorish heritage. Divine. Families - One child under ten stays free in an extra bed. Views - Some rooms have with views looking onto the Alhambra. Local markets - Explore Granada's bustling Moorish markets. Sights nearby - Ten minute walk from Granada Cathedral. Sumptuous hotel in 15th century monastery. Elegant rooms have wooden floors, antiques, woven drapes and modern bathrooms. Garden and courtyard. Fantastic Andalusian cuisine and romantic bar. Ideal for honeymoon or romantic European weekend.